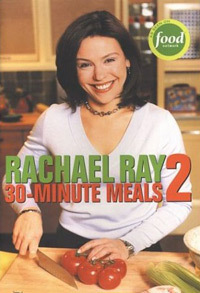 Rachael Ray’s 30-Minute Meals 2 is the companion cookbook to her television show on the Food Network. Ray’s approach is simple, straightforward and fun. “Having fun in the kitchen is what cooking is all about.” While she may not be the first author/chef to make this simple claim, she has certainly found a like-minded audience of cooks with her hugely popular show. Not many of the books we review have such fun yet oddly appealing dishes as Meatball and Macaroni Soup, Chocolate Dipped Bananas, Quick Italian Rum Cake Cups and You-Wont-Be-Single-For-Long Vodka Cream Pasta. There are no fussy ingredients or tricks in 30-Minute Meals 2, just fresh combinations of flavors and ingredients for dishes that, as promised, are ready in less than 30 minutes. A good collection of easy, yet new dishes for everyday meals and simple entertaining, ideal for novice cooks who don’t want to take things too seriously in the kitchen.